Amazing sightseeing, great beaches, friendly people and the best comfort food… Where to go to get the perfect combination of these ingredients? To Portugal of course – only a two and a half hours flight away from Luxembourg. 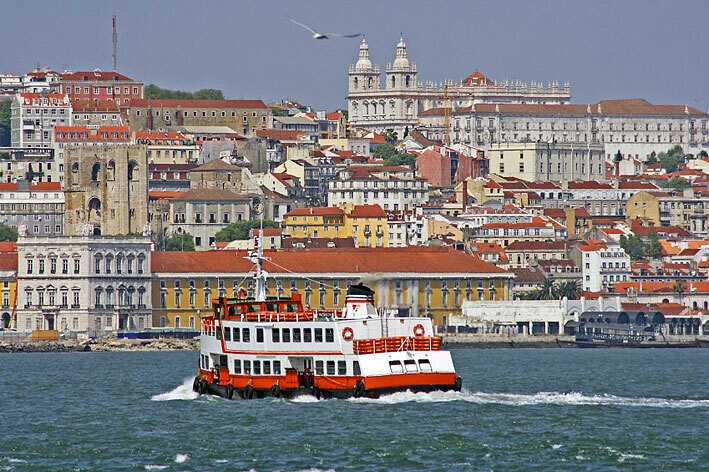 You can easily find almost daily flights to Lisbon, Oporto or Faro. Low cost airlines fly from Frankfurt Hahn to Oporto or Faro. From Luxembourg airport you can take a direct flight to Lisbon, using either TAP or Luxair airlines. This option is a little more expensive, but if you book some time ahead, you will often get a good deal. A city where you can find almost everything you could desire for a nice holiday or city break. It is known as the city of seven hills because of its seven peculiar and cosy neighbourhoods. Let’s start our journey through the capital of my home country. Picture yourself landing at Lisbon airport with your dearest ones. From the airport you can easily reach the city centre by taxi, bus or underground (or Metro as we call it). If you are travelling with kids or with a lot of luggage, a taxi or the airport shuttle might be best. Taxis aren’t expensive compared to many European countries, and the airport shuttle (Aerobus) runs between the airport and the city centre every 20 or 30 minutes, with frequent stops. On board there are screens showing each stop as the bus approaches. You can also rent a car at the airport – don’t forget to ask for a GPS, it’s really advisable. In Lisbon, you might opt for the Pestana Palace Hotel in the Ajuda neighbourhood, in a magnificent historical building with vintage decoration. To continue in the same style, choose the Tivoli Palácio de Seteais in Sintra for another couple of nights. If you are looking for modern design, you should choose Bairro Alto Hotel in the trendy and cool neighbourhood with the same name. You’d also love the Fontana Park Hotel designed by well-known Portuguese architect Francisco Aires. For a couple of nights in Cascais, you might stay at Grande Real Villa Itália Hotel & Spa. And finally in Tróia, the Tróia Design Hotel is a must, offering not only standard rooms but also spacious apartments just a few minutes walk from the beach. A more relaxed and family friendly option would be Aqualuz Tróia. After a delightful breakfast at the hotel of your choice, it is worth going to Belém to visit the Jerónimos Monastery, the Belém Tower and the Padrão dos Descobrimentos Monument. Then take a break and enjoy the famous pastries called ‘Pastéis de Belém’ (84-92, Rua Belém, right next to the Jerónimos Monastery). It is usually very crowded, but if you go in the morning it should be fine. Take the old cute tram 12 up to the Castle. Make sure you ask the driver where to get off, because it doesn’t go all the way to the castle entrance. Enjoy the view and a cup of coffee at the Miradouro de Santa Catarina. Walk through Rua Augusta, a nice pedestrian shopping street, until you reach the wonderful Terreiro do Paço square by the river, with its many restaurants. Museu da Cerveja restaurant is worth trying not only for its fresh seafood and great steaks, but for its very own beer museum. Walk through Rua Garrett until you reach Chiado and then Bairro Alto. Admire the art made and sold here by local artists and experience the unique feeling of the narrow and busy streets. You will surely notice the bronze statue of Fernando Pessoa, the beloved poet, in front of the famous A Brasileira coffee shop (120, Rua Garrett). 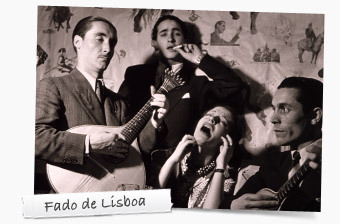 In the city centre, you should definitely go to one of the Fado restaurants, to experience this very special way of singing and expressing strong emotions. In Bairro Alto, you’ll find the Tasca do Chico (39, Rua de Diário de Notícias, Bairro Alto. Phone: +351965059670) and the Adega do Ribatejo (23, Rua Diário de Notícias, Bairro Alto. Phone:+351213468343). These simple restaurants are transformed when someone starts singing the Fado. If you are in Lisbon in June, there’s the traditional Santos Populares. This is a characteristic festival where, in each of the seven hills, people dance in the streets to traditional music and eat the typical sardines. 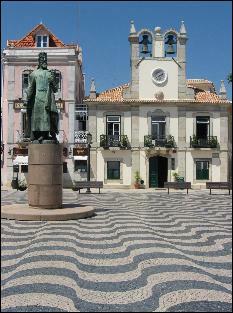 A good starting point could be the Campo das Cebolas square and from there just walk up the narrow streets and embrace the spirit of Alfama, the oldest district of Lisbon. Until August 25th 2013, you can visit the temporary exhibition by Joana Vasconcelos at the Palácio Nacional da Ajuda.This young artist is already internationally renowned for her creative and unique exhibitions. If you are travelling with kids, you should definitely visit the Lisbon Zoo, one of the largest zoos in Europe with a wide variety of animals from all over the world. You can easily spend half a day here, and the easiest way to get here is by underground to Sete Rios station. The oriental part of Lisbon, Parque das Nações, also offers some nice sightseeing, and lots of fun for the youngest ones. Take the underground to Gare do Oriente station and you’ll find a new part of Lisbon, constructed just after the Expo’98. Visit the impressive Oceanário de Lisboa, the biggest aquarium in Europe. Nearby you can also visit an amazing T-Rex exhibition in the Pavilhão do Conhecimento building, until August, 2013. You can also take the cable car and enjoy the riverside views, passing the monumental brand new Myriad by Sana Hotel. Continue walking along the river, and 5 minutes later you’ll reach a friendly coffee shop, Esplanando, with bicycles to rent. Take a well deserved rest and enjoy the views. From here there’s a 20 minutes walk back to the same underground station. The best way to taste traditional Portuguese food is the Tasca da Esquina Restaurant, with well-known Portuguese chef Vitor Sobral (41C, Rua Domingos Sequeira, Campo de Ourique. Phone: +351210993939). The prices aren’t excessive, and you can try several small portions of different specialties. It is strongly recommended to make a reservation. Another great option is 100 Maneiras Restaurant (35, Rua Teixeira, Bairro Alto. Phone: +351210990475), where Yugoslav chef Ljubomir Stanisic revisit Portuguese specialties. Other restaurants worth trying are Taberna Moderna (18, Rua dos Bacalhoeiros. Phone: +351218865039), Cervejaria Ramiro (1, Avenida Almirante Reis. Phone: +351218851024), and Solar dos Presuntos (150, Rua Portas de Santo Antão. Phone:+351213424253). I must say that in Cascais,about 45 minutes from Lisbon, I don’t feel like a local, but rather a foreigner, as there are so many English-speaking people living there. The city centre is small but cosy, with busy sandy beaches and lots of restaurants and bars. A must is Santini for delicious homemade icecream (28F, Avenida Valbom). In Cascais harbour, you’ll find several good restaurants. I suggest the Mercearia Vencedora Restaurant (Marina de Cascais.Phone: +351214823397) and their Picanha com Alho dish. I also recommend Tasca do Petisco Restaurant (5, Travessa das Amoreiras. Phone:+351214820036), for small portions of Portuguese delicacies. To taste the famous Bruxas (meaning “witches”, this is a type of seafood) with a unique sea view, you should visit Mar do Inferno Restaurant (Avenida Rei Humberto II de Itália, Boca do Inferno. Phone: +351 214 832 218). From Cascais you can easily take the train to Lisbon, to the last stop (Cais do Sodré) and then reach all of Lisbon by underground. Sintra, about 25 km from Lisbon, is definitely worth visiting, simply rent a car if you wish to go for a day or two from Lisbon. Quinta da Regaleira is an impressive building surrounded by beautiful and mysterious gardens. A guided visit is preferable to understand the history. 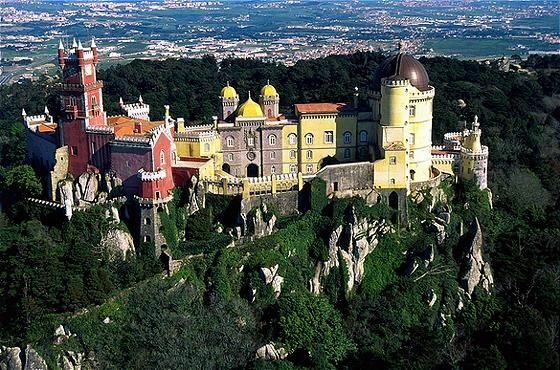 Two other places really worth seeing are Palácio da Pena and Monserrate Park. And don’t miss the local pastry called Travesseiros de Sintra. Most of the coffee shops sell them, but try them just seconds after coming out of the oven at Piriquita Cafe (1, Rua Padarias, in the centre). Just a few kilometres from the old town, the beaches of Praia Grande and Praia das Maçãs stretch out. The water isn’t that warm, but the beaches are quite spacious and beautiful (Praia Grande is bigger), and there are great places to eat fresh fish. If you are looking to have lunch by the sea, you should try the Restaurant Azenhas do Mar (Azenhas do Mar 2705-104, Colares. Phone: +351219280739). This place is simply amazing as you are literally by the sea, in the cliffs. At first glance, Tróia looks like a small island, but in fact it is a wide extension of sand entering the warmer waters of the Atlantic Ocean. To get there, take the A2 motorway from Lisbon to Algarve and then the Setúbal exit (about 50 km from Lisbon). Follow the signs to the ferry boat. Depending on the time, you can either have lunch at one of the restaurants offering fresh fish or go straight to Tróia by ferry, a calm 20 minutes crossing. The white sandy beaches will surely amaze you. 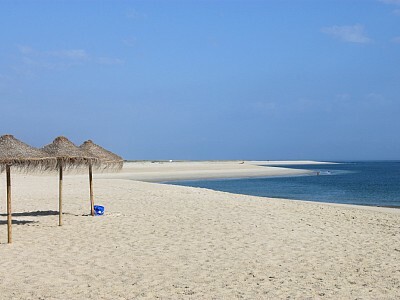 Other paradise beaches, Praia da Comporta and Praia do Carvalhal, are 5-10 kilometres away, both with good restaurants. When in Tróia, you should have fresh fish, for example at the Dona Bia Restaurant (Estrada Nacional 261, Torre. Phone: +351265497557) or the Museu do Arroz Restaurant (Comporta, 7580-612 Tróia. Phone:+351265497555). If you are looking for a different experience, you can also try dolphin watching. There are regular departures from Tróia harbour, but you are well advised to book in advance. So my friends, let me ask you: What more do you need to know to book your next holiday? That being said, there are too many beautiful places in Portugal to cover in one go – so stay tuned for the next Portugal chapter! Great articule, can’t wait to see more, after all we have a saying “vá para fora cá dentro”!